Our current best view of the storm comes from the 20th Century Reanalysis – this is essentially a modern weather forecast model used to simulate past weather by filling in the gaps between the fairly limited observations available. The movie below, made by Philip Brohan at the UK Met Office, shows a series of storms over the UK in February 1903 from the reanalysis. The largest storm is at the end of the month (26th-27th February). The date is shown in the bottom right hand corner. The ‘fog’ represents areas where we have so few observations that we have very little idea of what was happening. The yellow dots show where there are some observations – you can see ships out in the Atlantic, but west Scotland is empty. The red & blue colours indicate relative warmth or cold, and the green colours show rainfall (but this is very inaccurate for the Highlands of Scotland)! This is the type of situation where the efforts made by the volunteers on WeatherRescue.org can make a real difference to reconstructing past weather. The rescued pressure data for this period can be added into the reanalysis to improve our understanding of the track and severity of the storm. This is just one example of the benefits of recovering lost weather data – every data point will make a difference. 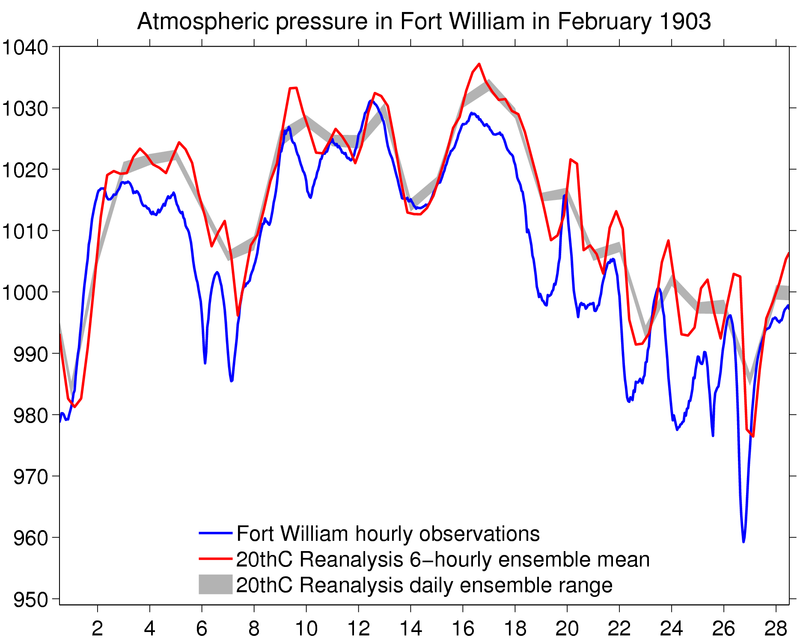 The figure below shows the newly rescued hourly pressure data for Fort William in February 1903 in blue. The red and grey lines show our current best estimates for Fort William from the 20th Century Reanalysis used for the movie. You will see they have similar patterns but disagree on the details, such as timing, and especially the depth of the low pressure passing at the end of the month – the Ulysses storm. Here is the exciting part… we can add the rescued data to the Reanalysis and see the effect on the reconstructed weather. In the image below, again made by Philip Brohan, the left hand panel shows the original pressure data, with the different lines representing the uncertainty in the position of the isobars and the storm. The observations used already are the yellow dots. On the right is a new version1 with the extra Fort William pressure data used (red dot). This shows much better agreement in the track and strength of the low pressure area. The single observation has improved our understanding about this storm. Of course, this is just one example. We will add all the newly recovered pressure observations by WeatherRescue.org into the 20th Century Reanalysis to improve our reconstructions of past weather over the UK. More broadly, insurance companies wanting to know about windstorms such as the Ulysses storm can potentially use this improved information to improve their understanding of risks. 1Technical footnote: this was done with a simplified version of the Ensemble Kalman Filter data assimilation system used in the 20th Century Reanalysis, which has not been rerun with this data yet. It should really be called the Yeats storm! Thanks Peter – it was clearly a very notable storm! We are hoping to rescue some more lost weather observations from around Europe which will include this event.